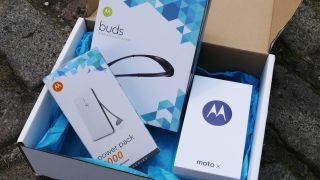 We've teamed up with Motorola to offer you the chance to win a Moto X, Moto Buds wireless headphones and a 2000mAh power pack in a prize bundle worth over £500. The brand new, second generation. Motorola Moto X comes in TechRadar's signature blue and pink, with the name of your favourite technology website etched on the rear. It sports a great 5.2-inch full HD display, powerful quad-core Snapdragon 801 processor, 2GB of RAM, 13MP rear facing camera and 2MP front snapper. You'll find the stock version of Android Lollipop on board, while the front facing speakers make the Moto X perfect for gaming and movies. To enter this great competition for your chance to win the Moto X bundle simply enter your email address below. This competition is open to UK residents over 18 years of age. For the full rules please click here.